The # 1 New York Times bestseller A Girl Named Zippy was a rare and welcome treat: a memoir of a happy childhood. Spunky, strong-willed, and too smart for her own good, Zippy Jarvis brought readers delight and joy. In She Got Up Off the Couch, Haven Kimmel invites us to rejoin the quirky and hilarious Jarvis family saga, shining the spotlight now on her remarkable mother, Delonda. Zippy is growing up and struggling with both her hair and her distaste for shoes. But this memoir strikes a deeper and more emotional chord, as now Kimmel shines the spotlight on her remarkable mother, Delonda. Courageous and steadfast, Delonda finally realized that she could change her life, and she got up off the funky couch in the den, bought a beat-up flower power VW bug (and then learned to drive it), and went back to school, which gave her the chance to gain both financial independence and, at long last, self-respect. A true pleasure for old fans and new ones alike, She Got Up Off the Couch is a gorgeous encapsulation of an innocent time when a child didn't understand that her mother was depressed or felt stifled, but just noted on her way out the door that Delonda was a fixture in the living room. Kimmel captures the seminal moments of her mother's burgeoning empowerment with the full strength of her distinctive, deft storytelling, and with the overflowing sense of humor that made A Girl Named Zippy a favorite of readers everywhere. When we last saw Zippy Jarvis, she was completely oblivious to the storm that was brewing in her home-her mother, Delonda, had literally just gotten up off the couch and disappeared down the road on her bicycle. Zippy's dad was mysteriously absent. And Zippy was lost in her own fabulous world, exploring the fringes of her hometown of Mooreland, Indiana, whether animal, vegetable, or mineral. In She Got Up Off the Couch, Haven Kimmel revisits this quirky, chaotic habitat, as she catches up with old characters and new. Zippy's further adventures include witnessing her mother overcome the emotional claustrophobia of her small-town, married-with-children life. Zippy watches as Delonda conquers her depression and learns how to drive a car, even though she doesn't have regular access to one once she's learned. Against her husband's wishes, Delonda gets up her courage to apply to the local college and graduates with honors at the age of forty. In many ways, this is Zippy's mother's book- even as we are entertained by the many stories involving small animals and Zippy's endearing friends, a profound sympathy emerges for the strong mother who found a way not only to save herself, but to set a proud example for her devoted daughter. 1. "Mooreland, Indiana, was paradise for a child...small, flat, entirely knowable." Why might Zippy's feelings about her hometown of Mooreland as a child differ from those of her parents and the other adults who live there? How would you characterize the town and population of Mooreland, based on Zippy's adventures? 2. Why does Zippy's mother spend so much time at home, and what finally motivates her to get off the couch? In what ways does Zippy's dad, Bob, discourage his wife from meaningful intellectual or social activity? How does Delonda's decision to enroll in college affect their marriage? 3. "I did not accept Jesus as my personal savior on Tuesday night, or Wednesday, or Thursday, or Friday." What role does religion play in Zippy's life? What do her experiences at church camp and the Mooreland Friends Church reveal about her own feelings about religious faith, and how do those feelings connect to her family's wider attitudes toward religion? 4. When Haven Kimmel writes: "There was no place I was fully safe. My whole life was infested," what does she mean? What does the infestation of mice and rats at Zippy's house represent to her? Is it fair to say Zippy suffered from neglect as a child? 5. How would you describe Zippy's relationship with her father, based on his handling of her record collection, his behavior when she shattered her arm, and their other encounters as father and daughter? What does Zippy's decision to confront her mother with suspicions of her father's extramarital affair reveal about her feelings for him? 6. How does Zippy's older sister, Melinda, help her survive her eccentric childhood? Why does Zippy react so emotionally to Melinda's marriage and the births of her two children? What explains the trust they place in each other, and how does Zippy significantly enlarge that trust during the climactic blizzard of 1978? 7. What does Parchman William's unsuccessful effort to have "the talk about racism" suggest about Zippy's upbringing and her parents' respective racial attitudes? How does this talk affect her? 8. How do Delonda and Bob differ in terms of their professional interests and their extracurricular activities? How do you think they managed to stay married for over twenty-five years? To what extent does the silver anniversary party that Melinda throws them reveal some of the turmoil at work in the state of their union? 9. "Mother's evolution, personal as it was, is also the story of a generation of women who stood up and rocked the foundations of life in America." How do the changes Delonda makes to her life as a middle-aged, married, mother of two typify those of other women of her generation? What do these changes mean to Zippy? Does she appreciate her mother's choices? 10. How does Haven Kimmel, the author of She Got Up Off the Couch, incorporate humor into her poignant memoir of growing up in Mooreland, Indiana? Which anecdotes in the memoir did you find especially comical, touching, or memorable? Why? 1. In She Got Up Off the Couch, Haven Kimmel describes in detail two friends, Julie and Rose, whose influence stretches into her adulthood. Who are some of the childhood friends who have continued to affect and influence your life? What unique talents and personal characteristics do these friends have? Share your memories and funny anecdotes with the members of your book club. And make sure to bring plenty of embarrassing pictures! 2. Are you interested in seeing what Zippy looks like now? To learn more about Haven Kimmel and to listen to her discuss her work, visit her personal website: http://www.havenkimmel.com/ and click on the links to recent interviews. 3. She Got Up Off the Couch is Haven Kimmel's poignant memoir of her childhood. Have you ever considered writing a memoir about your life? The Memory Archive: http://www.memoryarchive.org/en/MemoryArchive allows visitors to add their fondest memories to an online and constantly growing encyclopedia of personal recollections. Haven Kimmel is the author of The Used World, She Got Up Off the Couch, Something Rising (Light and Swift), The Solace of Leaving Early, and A Girl Named Zippy. 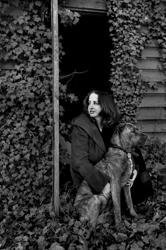 She studied English and creative writing at Ball State University and North Carolina State University and attended seminary at the Earlham School of Religion. She lives in Durham, N.C.
"She Got Up Off the Couch returns to the small-town life that made Kimmel's childhood memoir, A Girl Named Zippy, a bestseller. But this less-sunny sequel looks more tellingly at things that were glossed over in the first book. Zippy's father, for example, is hardly the hero she worshiped as a young girl. And the dirt and disorder the tomboy gloried in has a darker reason: After decades married to a gambler, Delonda had given up. Kimmel never indulges in bitterness, but by the end a reader will be in no doubt about the Kilimanjaro of obstacles her mother scaled on her way off that couch." 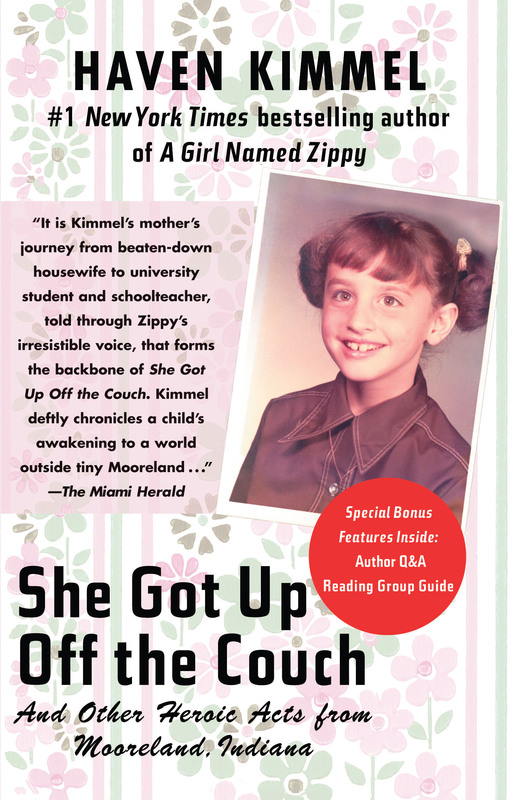 "It is Kimmel's mother's journey from beaten-down housewife to university student and schoolteacher, told through Zippy's irresistible voice, that forms the backbone of She Got Up Off the Couch. Kimmel deftly chronicles a child's awakening to a world outside tiny Mooreland..."